Inside is this week’s theme from WordPress. The last time WordPress chose this as a theme, my response took you to Sillustani near the waters of Lake Titicaca in Peru. Today’s answer takes us again to South America, but this time to the country of Brazil and its city of Rio de Janeiro. Previous posts about our vacation stop in this city have highlighted landmarks such as Sugarloaf Mountain and Christ the Redeemer. We were able to see those sights and many others courtesy of a tour operator that we had hired for the day. Near the end of the trip, our tour guide took us down the fabled beaches of Rio (including the Copacabana). 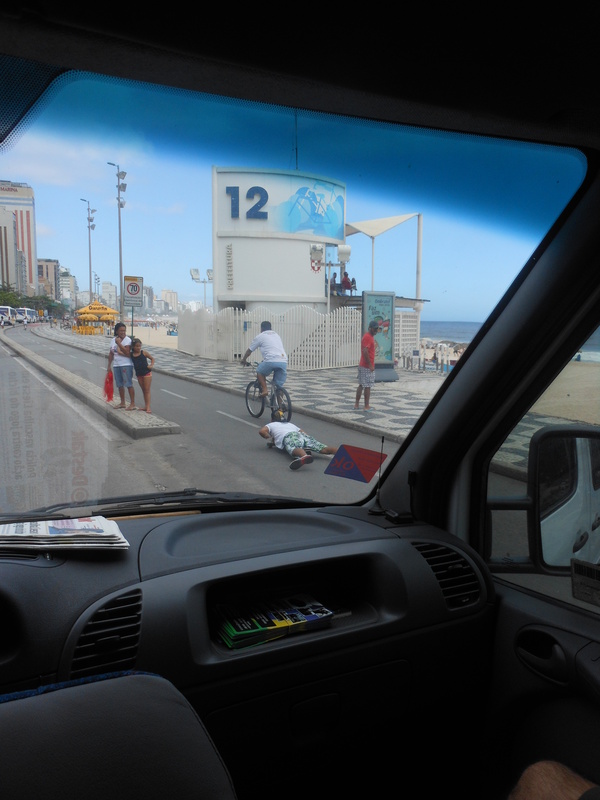 One of the trademarks of the beach front portion of Rio is the distinctive sidewalks. Each section of this Brazilian city has its own pattern of black and white mosaics laid into the sidewalks. People in the know (and if they have enough street sense) can identify where they are on Rio’s beach scene simply by looking at the tiles. While inside (and there’s my hook for this picture, thank you muchly) our tour van attempting to take pictures of this dichromatic diorama, we saw a scene that demanded its own picture. You can see the black-and-white pattern of the sidewalk (and savvy travelers will be able to identify exactly where we are), but you can also see a guy lying on his stomach on a skateboard which is being pulled by a rope attached to the bicycle in front of him. I can only wonder what is going on inside both of their heads to try such a stunt. Posted on March 16, 2014, in Brazil, Photography and tagged Brazil, photography, Rio de Janerio, travel. Bookmark the permalink. 10 Comments. Thanks. When we first saw this duo, it took us a moment to understand why the guy on the sidewalk was moving as smoothly as he was. I thought about doing my ‘inside’ photo from inside the car too, was going to look up through the sunroof…but the skys were boring this weekend…I really like this one! Thanks for the comment and for stopping on by. Pingback: Weekly Photo Challenge: Inside (Rain) | What's (in) the picture?